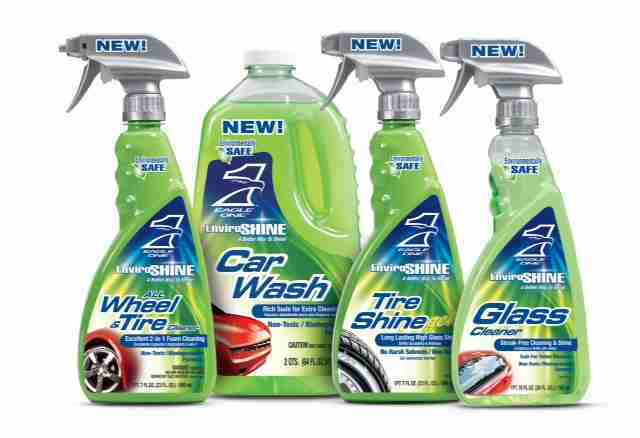 Four new EnviroShine™ products are now offered as a “green” alternative for auto enthusiasts. Nationwide, more than 32 million pounds of household cleaning products that may contain harmful chemicals are poured down drains each day. In response to a growing number of auto enthusiasts who want environmentally friendly alternatives to traditional car-care products, Eagle One is rolling out a new line of appearance products, EnviroShine. The four new products, are the first line of “green” automotive appearance products to be launched nationally by a major automotive brand. Eagle One leveraged its full technological resources to create this new line of products. Commonly used petroleum-based chemicals have been replaced with ingredients that are safer for the environment. These new formulas are free of harsh acids, solvents, phosphates and petroleum distillates that can be harmful to humans and animals. EnviroShine’s car wash, wheel cleaner, and glass cleaner formulas are also biodegradable and will not produce run-off that could harm aquatic life or the water system, or fumes that may impact air quality or the ozone layer. ● EnviroShine Wheel & Tire Cleaner – Formulated in a convenient foam spray that hoses off to remove brake dust and road grime, it leaves cars with shiny wheels and clean tires. The cleaner is safe for all types of wheels, including clear coats. ● EnviroShine Tire Shine – Featuring a non-sling thick formula, the new tire shine gel spray provides a glossy black shine that is long lasting and weather resistant. ● EnviroShine Car Wash – Formulated to create rich suds for extra cleaning power, it gently lifts dirt to enhance a wax shine and is safe for all finishes. ● EnviroShine Glass Cleaner – Quickly removes tough dirt and grime for a streak-free shine. It’s ammonia- and alcohol-free and safe for tinted windows. I test drove these products on my car and found that there was no compromise, these green products were just as effective as traditional products. It’s time to switch to something that won’t harm the environment but still protect your investment. Eagle One brings us this “green” car-care appearance products to market nationally, EnviroShine is sold through leading auto part retailers nationwide. For more information, please visit www.eagleone.com.